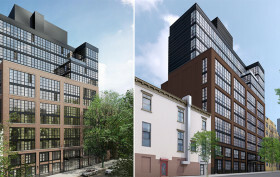 The Naftali Group’s 12-story condominium dubbed The Seymour has topped out just six months after breaking ground. Though we’ve yet to see the traditional topping-out tree, a flag can be seen pitched atop the concrete frame of the building’s bulkhead–a sure sign of the completion. Sales have been just as speedy with more than half of the building’s 67 units in contract. According to CityRealty, there are currently nine units available on the market with an average price of $1,882 per square foot, ranging from $1.3 million for a one-bedroom unit to $3.95 million for a three-bedroom home on the 10th floor.